Dr. David Ilson is a medical oncologist in who lives in New York and currently works at Memorial Sloan Kettering Cancer Center. 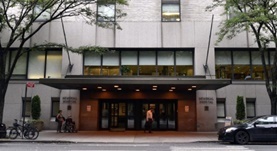 He got his medical degree from New York University School of Medicine and completed an internship and a residency at Bellevue Hospital Center. He completed his studies with a fellowship at Memorial Sloan-Kettering Cancer Center. Dr. David Ilson is board certified in internal medicine and oncology with over 20 years of practice. Dr. David Ilson has contributed to 3 publications. Recurrence and Survival After Pathologic Complete Response to Preoperative Therapy Followed by Surgery for Gastric or Gastrooesophageal Adenocarcinoma. Fields RC1, Strong VE, Gönen M, Goodman KA, Rizk NP, Kelsen DP, Ilson DH, Tang LH, Brennan MF, Coit DG, Shah MA. Choroidal Metastases from Esophageal Adenocarcinoma Responding to Chemotherapy with Cisplatin and Irinotecan. Morris PG1, Oda J, Heinemann MH, Ilson DH.